This chest measures 55 1/4" High X 31" 1/2 Wide X 18" deep. 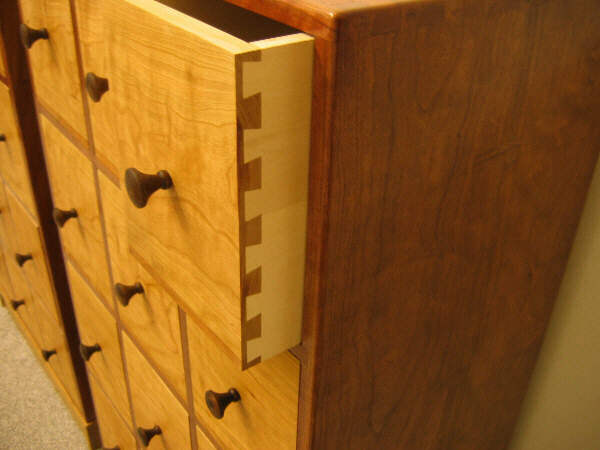 The drawers are fully hand dovetailed and have an almost airtight fit. 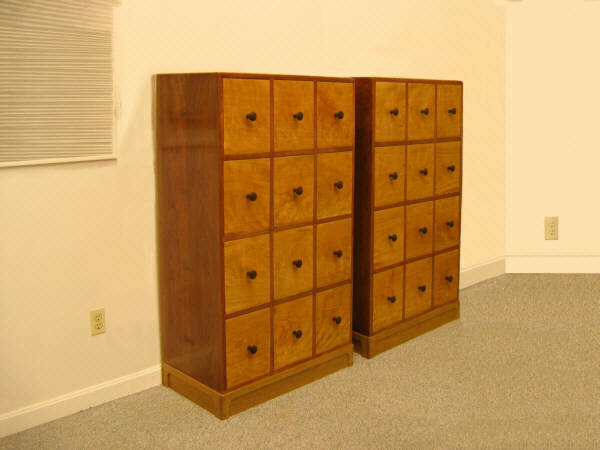 Drawer bottoms may be made of aromatic red cedar to repel insects and to provide a nice fragrance. Drawers hold all "Ages" or sizes of comics. Set up in a room. 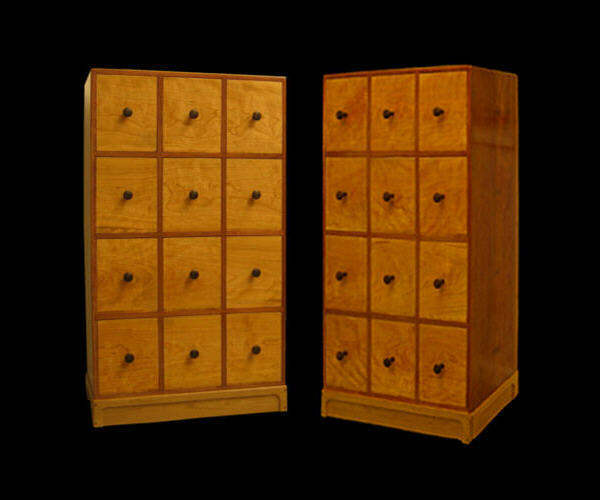 The chest may be constructed of various hardwoods. Mixing and matching the woods for the top, sides, drawer fronts, knobs and pegs will give a wide variety of interesting looks. Cabinet tops are joined to the sides using many finely made dovetailed joints. Dowel pegs may be interspaced between the dovetails as a design accent. Cabinet sides and tops are matched using butterfly joints. Secondary woods and drawer insides are made of high quality #1 pine, basswood or poplar. 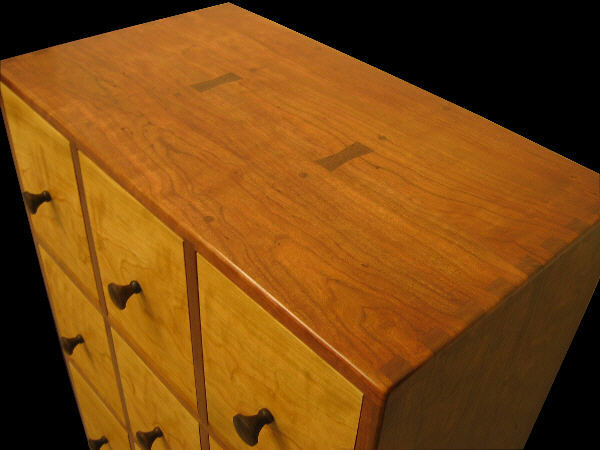 Drawer bottoms are made of aromatic red cedar to repel moths and silverfish. All surfaces, inside and out are finely sanded. The drawers are each fitted with an almost airtight fit. Drawer insides are finely sanded but left without a finish for archival purposes, so as not to interact with or damage contents. Copyright ©2004 - 2011 Stan Pike Designs. Copyright ©2004 - 2009 Stan Pike Designs. The casework may be constructed of various woods although hardwoods are recommended. Mixing and matching for the top, sides, drawer fronts, knobs and pegs will give a wide variety of interesting looks. Cabinet tops are joined to the sides using many finely made dovetailed joints. Dowel pegs may be interspaced between the dovetails as a design accent. Cabinet sides and tops are joined using butterfly joints. 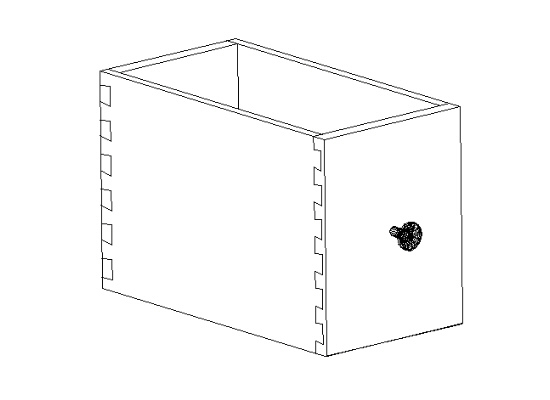 Drawer insides are made of high quality basswood for stability and strength. Drawer bottoms are made of aromatic red cedar. All surfaces, inside and out are finely finished. 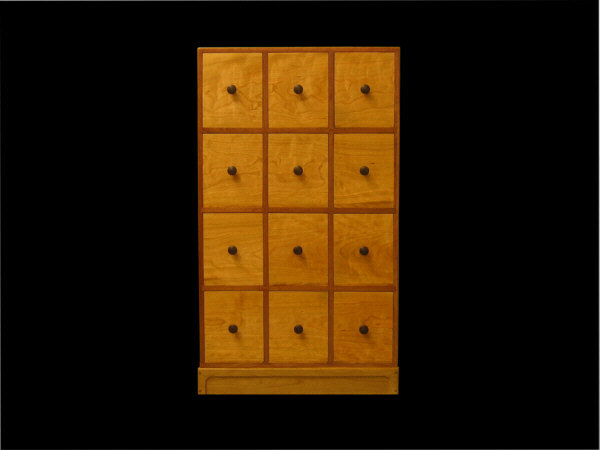 Drawers are made to perfection, made with an almost airtight fit. Drawer insides are left unfinished in order not to damage contents.